Cranmer Hall Barn01263 715779work01603 870304fax Self-cateringBreathtaking style and comfort awaits at this beautiful barn which was built in the early 1800's and is nestled in the rural countryside not far from the spectacular Norfolk coastline with its pretty towns and quiet villages. Relax and unwind within this huge and unique living space which has been finished, furnished and equipped to a high standard to include a unique Swedish wood burner, hand made Bryan Turner kitchen and bespoke marble bathrooms. Enjoy exploring the Royal Norfolk Coast which is home to HRH Her Majesty the Queen's country residence at Sandringham and return to Cranmer Hall Barn at the end of a busy day to relax like royalty in your own slice of luxury! • Good Housekeeping Deposit: There is a £500 deposit payable for this property. 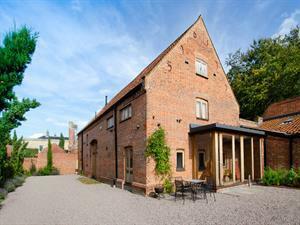 Cranmer Hall Barn offers weekly bookings starting on Saturday. Cranmer Hall Ba offers weekly bookings starting on Saturday. Breathtaking style and comfort awaits at this beautiful barn which was built in the early 1800's and is nestled in the rural countryside not far from the spectacular Norfolk coastline with its pretty towns and quiet villages. Relax and unwind within this huge and unique living space which has been finished, furnished and equipped to a high standard to include a unique Swedish wood burner, hand made Bryan Turner kitchen and bespoke marble bathrooms. Enjoy exploring the Royal Norfolk Coast which is home to HRH Her Majesty the Queen's country residence at Sandringham and return to Cranmer Hall Barn at the end of a busy day to relax like royalty in your own slice of luxury!